Here's your chance for a break in paradise! You can be lounging on this sugar-white sand, breathing in that salty-air breeze and listening to the waves before you know it. Your tropical oasis is waiting for you on the Alabama Gulf Coast! 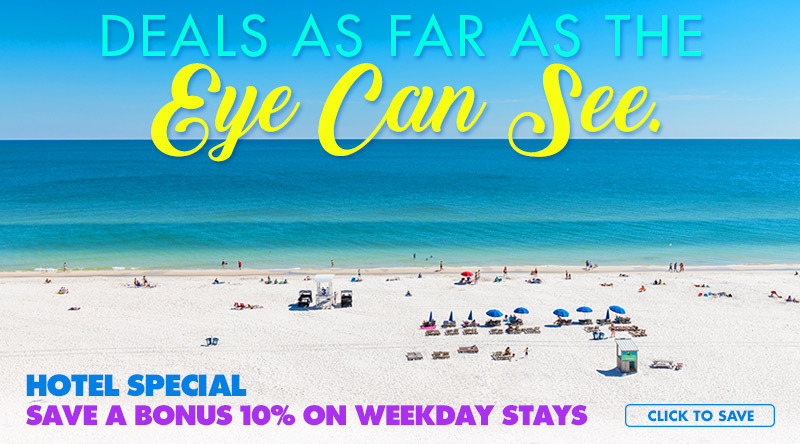 Don’t miss these seaside savings! Vacation Sunday through Thursday from now until May 15th and save a BONUS 10% off! Don’t wait and book today by calling 877.398.5637 to speak with a local vacation specialist or reserve your place online now! Go ahead and slip away from your everyday! **Subject to availability, restrictions apply. New reservations only. Bonus 10% off on stays Sunday through Thursdays between March 15-May 15, 2019. Monthly rates, special events and holidays excluded.